The Canon PowerShot SX210 IS has lots of design quirks, but its small body packs in a versatile range of features. It includes a 14x zoom lens, an f/3.1 lens and the ability to control the exposure manually, and you can also shoot video at 720p. Its overall image quality is good, albeit soft, but it's a fine compact shooter to have at your disposal for everyday snaps and is an ideal size to take with you while travelling. The Canon PowerShot SX210 IS is the high-end option in Canon's 'Point and Shoot Plus' range, which also includes cameras such as last year's PowerShot SX120 IS compact digital camera. It's aimed at users who demand a heck of a lot from a point-and-shoot camera; you get advanced features such a 14.1-megapixel CCD sensor, a 14x zoom lens, and the pocket dynamo even gives you the option to use manual settings. Its lens can take shots from a wide angle of 28mm, right up to a tele-zoom angle of 392mm (35mm equivalent). This is even more far-reaching than Panasonic's LUMIX DMC-TZ10 digital camera, which has a shorter tele-zoom angle of 300mm, but a larger wide angle of 25mm. The Canon also has a wider aperture range from f/3.1 (f/5.9 when zoomed) to f/8.0, and its shutter speed ranges from 15sec to 1/3200sec. With such a versatile range of photographic parameters, the PowerShot SX210 IS can take great shots in just about any situation — whether you want to take portraits, landscape or macro photos — and it will even perform reasonably well in low-light conditions. However, the physical design of the camera makes it uncomfortable to hold and difficult to use. The zoom rocker is tiny and hard to move easily; whereas the mode dial is located on the rear of the camera (instead of the top), it makes a loud clicking noise and it's hard to turn. The fact that your thumb needs to rest on the mode dial when shooting, means the dial stiffness is required to ensure the dial stays in the correct mode position. Nonetheless, it takes time to get used to putting your thumb on the mode dial, and inevitably you end up straying left of it and leaving a giant thumbprint on the 3in LCD screen. We'd rather the mode dial was located at the top of the cameras with the zoom rocker encircling it. As shown above the control layout of the PowerShot SX210 IS illustrates the physical design flaws we found in our tests. Another annoyance we discovered when testing this camera is the built-in pop-up flash. This automatically opens up when you switch on the camera, similar to the pop-up headlights on a Mazda RX7. On an RX7 though, you are unlikely to have your left hand on the headlight as it pops up — but it's very likely your hand will be on the PowerShot's flash. Generally most users would hold the camera with their left hand while using their right hand to switch it on. In our tests we couldn’t find a workaround this issue; if you hold the digital cameras with your fingers placed front and back, you'll impede the lens; if you hold it with your fingers placed top and bottom, you'll stop the flash from popping up. There is no setting in the menu to stop the flash from popping up automatically, and it quickly gets frustrating. 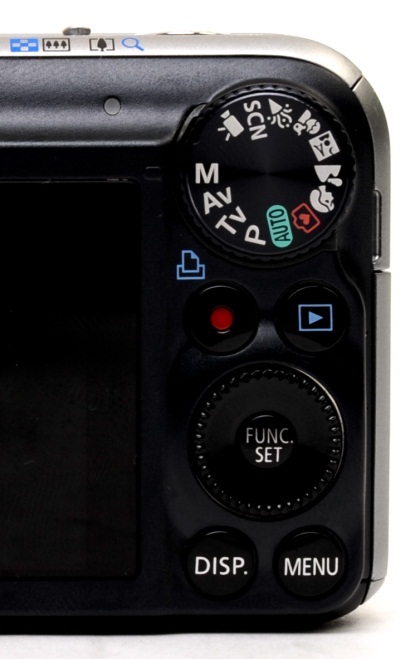 The last annoyance is the lack of labels on the 5-way button and rotating control on the rear (see image above). What happens when you press the top button? What about the left one? You can find out by pressing them, and by pressing them often enough so that you memorise what they are for. Or, you could leave your thumb resting on the control for a couple of seconds and a menu will pop up on the screen to tell you that the left button is for changing to macro mode, the right button is for the flash mode, the bottom button is for the timer, and the top button is for switching between the aperture and shutter in manual mode. How this design is more intuitive than using clearly printed labels, we have no idea, and the worst part is that the menu sometimes doesn't show up when you need it to explain the functions. It's disappointing that our tests revealed this camera’s many usability quibbles because it's also a solidly built camera, and it has a good amount of weight that allows you to hold it steady while you take your photographs. It also has plenty of power saving measures that can prolong the life of the battery. Its sleep mode switches off the screen when the camera has been sitting inactive on a table for 1min, and it automatically switches back on when you pick up the camera. However, if you don't pick up the camera within 3min, it switches off completely. Neutral, slightly underdone colour and decent clarity is what you can expect from pictures taken with the Canon PowerShot SX210 IS, but there is also a lot of softness and some haloing, which show up primarily in the highlights. Furthermore, even though you get a large number of megapixels, cropping the photos too tightly is a no-no because the photos will lose a lot of detail when you view them at their full size. Instead, take photos that are perfectly framed so that you won't have to consider cropping. That said, if you view the photos from the SX210 IS on a big screen they will look great, and you can even print them out at up to an A3 size with pleasing results. But if you crop a tiny detail out of the huge photos with the intention to view that detail at a larger resolution, you'll also end up exposing the muddy pixels in the image. Unlike the SX120 IS, the 210 IS doesn't suffer from fringing as badly, but its overall image quality does look a little softer than the older PowerShot SX120 IS camera. It's the same trait we noticed in the Panasonic LUMIX DMC-TZ10, and it's a softness that manifested itself primarily in bright conditions. Another trait it shares with the LUMIX DMC-TZ10 is the PowerShot's bokeh pattern, which is also nice and round. It's slightly less pronounced on the Canon camera, but it nevertheless shows that you can achieve a good depth of field with this small camera. 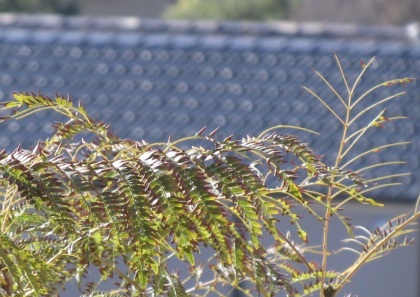 A relatively big aperture of f/3.1 gives the camera a good depth of field that allowed it to produce a nice bokeh pattern on the background roof tiles in this image. However, you can also see some haloing and an overall softness in the branches in the foreground. We like the fact that the shutter and aperture controls can be easily changed when in manual mode, and the results of your changes immediately show up on the LCD screen — but keep in mind that photos will look brighter on the camera's screen than they will on your PC's monitor. There is also an on-screen meter so that you can see if the shot is perfectly exposed. Using the auto or semi-auto modes to expose your photos can sometimes leave them looking a little too pale, so you'll either want to use the manual mode to make adjustments, or you could also play with the colour settings to get a more vivid picture. 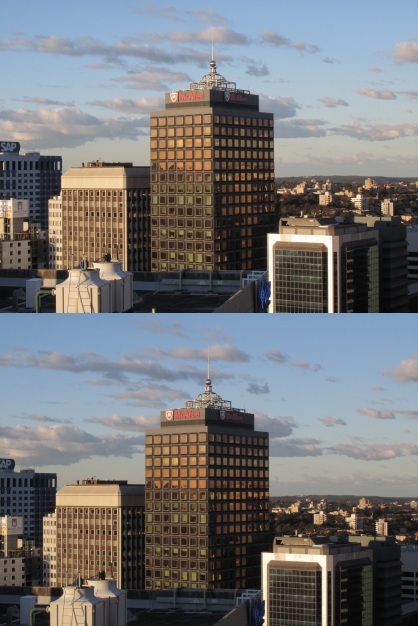 The top photo was taken with a perfect exposure according the meter, while the bottom photo was taken with slight underexposure. The bottom picture is more indicative of what we were looking at in real life. The wide 28mm angle comes in useful if you want to shoot a large area up close, but there is noticeable distortion on the vertical plane. 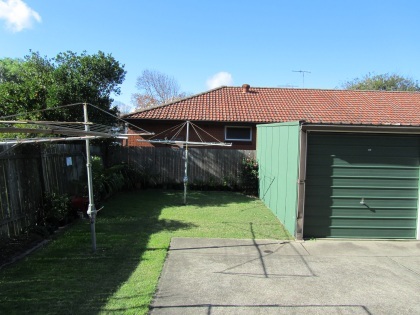 It should appeal to real estate agents who seems to favour wide angle shots for use with house listings. 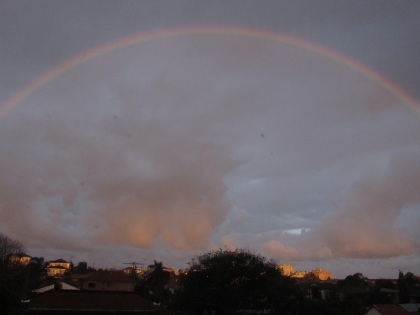 But it wasn't wide enough to capture this rainbow in full from our vantage point. You win some, you lose some. The overall picture quality of the Canon PowerShot SX210 IS looks a little soft, and its colours are slightly underdone by default, but you can play with the manual settings to fix the latter problem — although you might need a Photoshop degree to fix the softness. We like the versatility of the lens and the camera’s manual settings, but we believe the control layout and design of the camera could be improved. Most users may get used to the camera’s physical design if they're exposed to it long enough, so if the Canon PowerShot SX210's big lens, compact body and manual settings appeal to your specification wishlist, don't let the design dissuade you from considering it.